Our CLIMBER'S LUGGAGE is built to take all the punishment of car camping, air travel, or many seasons of overland trekking. As each's name implies they are scaled to match your every adventure - from a simple ONE NIGHT STAND to a full scale WORLD TOUR. 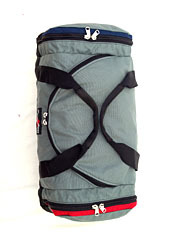 Oversized, curved double sliding zippers are strong, can be pad locked shut and give complete access via "hinged" top hatch. 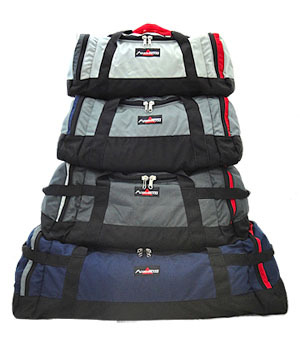 Dual color coded end pockets likewise unzip completely to reveal their full contents and on the SPRING BREAK and WORLD TOUR are large enough store a pair of mountain boots. 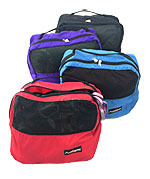 Top handles may be used as shoulder straps for luggin' your gear from taxi to terminal while end handles allow you and your partner to carry a an "extra" Bag between you. Ballistic nylon bottoms and 1000 denier Cordura bodies assure a long life. New classic color combos. As always, made in California! 29" x 15" x 13"
38" x 15" x 13"